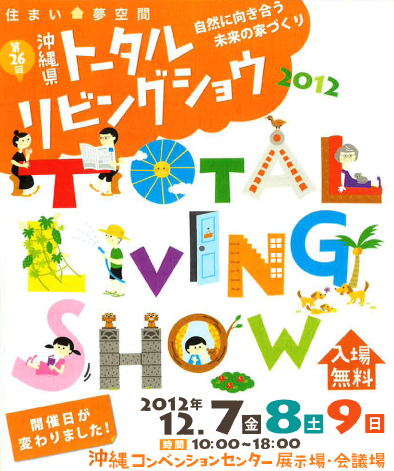 “Building house matching nature” is the theme of the 26th Okinawa Total Living Show, which this year opens tomorrow at the Ginowan Convention Center. The three-day event runs Friday through Sunday, 10 a.m. to 6 p.m., bringing together 58 housing-related companies to perform demonstrations and exhibitions. Industry experts say they’ll teach visitors the many things important to make life easy in the new home. There are many lectures and demonstrations throughout the three days. For example: A lecture on how to clean up your house runs 10:30 a.m. ~ Noon Saturday. It is free. From 3 p.m. ~ 4:20 p.m. on Sunday there’s a lecture on preventing disasters, where visitors can learn what to do when a disaster strikes. There’s a kids area set up 10 a.m. ~ 6 p.m. on both the 8th and 9th.